Many things have changed… or have they not? Do you plan ahead what to serve your partner for dinner the next day? Before he gets home, do you make sure you’re all pretty and refreshed? Have you made sure that everything’s tidy for his arrival? Are you ready to be all smiley to cheer him up after a long working day? If you answered with ‘yes’ to those questions, you seem to make a pretty good housewife so far! I’m not married, but I have a boyfriend and since living with him and having quite some free time atm, I happen to do those things above. 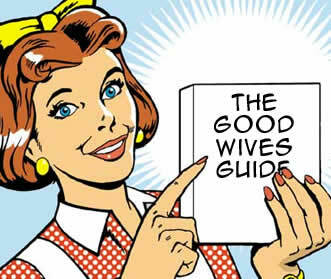 These suggestions from ‘The Good Wife’s Guide‘ may have been published in 1955, and many things have changed since, yet many women still comply with such roles, be it because they somehow have to or because they want. I personally do it voluntarily because I enjoy it. My boyfriend doesn’t ask me for anything but I like preparing dinner and I’m happy when he comes home and naturally ask him about his day and so forth. For me, it has nothing to do with gender roles. If I was working 10 hours a day and he was at home in the afternoons I’m sure he’d do the same. Back then it was extreme though, advising women how to behave towards their husbands. We may be evolutionary better adapted to different roles but luckily society nowadays greatly accepts different opinions and traditional gender roles are no longer ‘to be followed’. Funnily though we even find the opposite these days; feminists who are mad at women who want to be housewifes. I’m neither a non-feminist nor a radical feminist, I simply believe in free will. If you want to be a housewife, go ahead, if you’d rather work 24/7, so be it. Due to the interdependent nature of males and females and the long history of female suppression, sexism is and will probably remain hot topic. Anthropological research shows that patriarchy (men having power over women) is pretty much universal (Goldberg, 1993). This affects gender roles and stereotypes. Male structural power relates to hostility towards women. Due to men and women being interdependent though, inter-group attitudes are not just hostile but also benevolent. Hence, sexism is ambivalent. Both benevolent and hostile sexism maintain and justify patriarchy and traditional gender roles. They share three sub-components with hostile and benevolent aspects. This shows how not just hostility towards women but also benevolence create sexism. It is the simultaneous existence of male structural power and female dyadic power that give rise to ambivalent sexist ideologies. Why can’t we just apply equality to everyone (not just in terms of Mars vs Venus), stop stigmatising and stereotyping, accept each and everyone as they are, stop fighting and arguing, and just live our lives the way we want!? Will all that drama ever end? Well, we’ve come a long way and we have made great progress in recognising problems at hand, so there is hope that, some day, we will look at each other with open eyes and not with goggles on that narrow our views. This entry was posted on 17/06/2013 by G in Cultures, Psychological Issues and tagged ambivalent, benevolent, competition, complementary, dominance, equality, evolution, feminism, gender differentiation, gender roles, good wife's guide, heterosexual, hostile, interdependence, intimacy, open-minded, paternalism, pominative paternalism, power, problems, protective, sexism, sexuality, stereotypes, stigma.